Have you been wanting to get in on the cauliflower rice party but weren’t sure where to start? 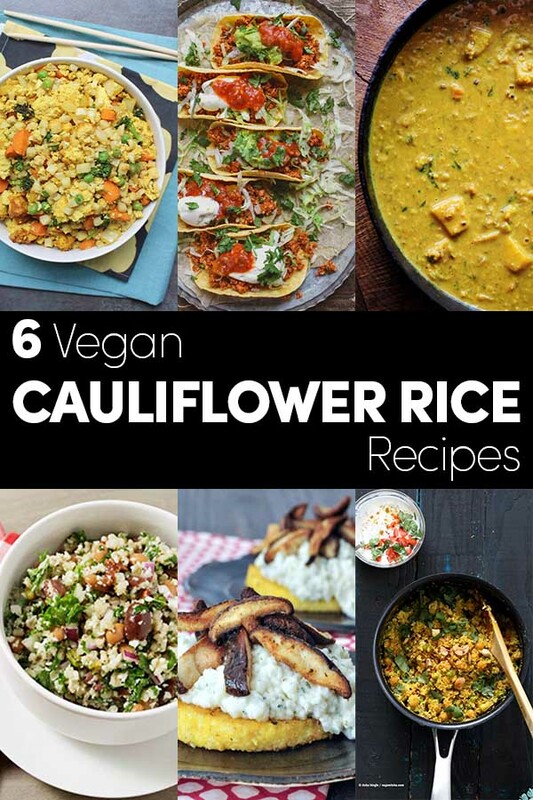 Get the basics for how to cook cauliflower rice, plus some amazing recipes to help you on your veggie journey. Whether you’re trying to avoid rice because of the potential arsenic contamination or are just trying to sneak some extra vegetable servings into your day, cauliflower rice is a delicious way to make it happen. You can cook cauliflower rice from scratch, and you can often find riced cauliflower in the produce or freezer section of your grocery store. If you don’t want to pay a premium for pre-riced cauliflower, you can easily make your own. Plus, a whole head of cauliflower will keep longer in the fridge than a bag of cauliflower rice. In this video, you can see how to make your own cauliflower rice with a food processor. The video includes tips on how to store your cauliflower rice properly, too! If you don’t have a food processor, don’t worry! You can still get in on the cauliflower rice action. Just use a box cheese grater, like the one pictured above. The largest holes are the ones that will give you that good, rice-like consistency. Don’t have a cheese grater, either? No problem. A good ol’ knife will do the trick. You’re basically mincing your cauliflower into smaller-than-a-pea-sized pieces. It can be a bit time-consuming, but it works. Once you’re done ricing your cauliflower, you have a few options for how to prepare it. You can serve it raw, but I find that cooking cauliflower rice mellows the flavor a bit, giving it a more rice-like taste and mouthfeel. KD Angle-Traegner shared this basic recipe for cauliflower rice, and it’s as tasty as it is fool-proof. Check out her Care2 post for more creative uses for cauliflower, too! Like rice, cauliflower rice is the perfect vehicle for herbs and spices and can be used in replace of the rice grain in almost any dish. Itâ€™s also a great way to sneak more servings of vegetables into your diet. Making cauliflower rice couldnâ€™t be easier either, all you need is a box grater and a skillet. Wash and cut cauliflower into large sections. 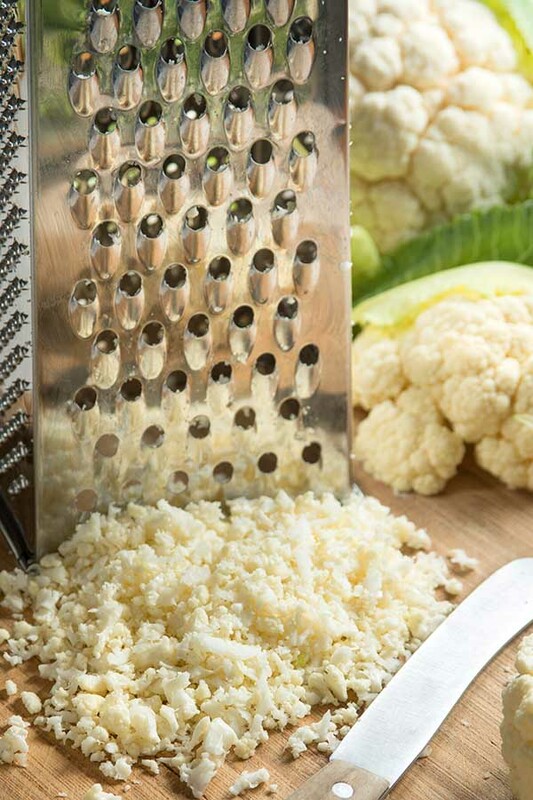 Using a box grater, grate cauliflower into rice-size pieces using the medium-size holes. Place grated cauliflower onto a clean, dry towel or paper towel and press to remove excess liquid. This will prevent your rice from being too soggy. Add rice to a pre-heated skillet over medium heat with 1 tablespoon of olive oil. SautÃ© for approximately 5 minutes or until tender. Add seasonings as desired. You can use cauliflower rice basically anywhere you’d use regular white or brown rice. It’s great as a base for a sushi bowl, stuffed into a burrito or sautéed with veggies, fried rice-style. The only place I’d say cauliflower rice doesn’t work well is in sushi, since sushi relies on rice’s stickiness to bind the roll together. Got your riced cauliflower ready to go? Try one of these deliciously vegan cauliflower rice recipes. Not all of these recipe call for sautéing the rice, so make sure you read the recipe before you start your prep work! You can make fried cauliflower rice on the stovetop just like you’d make any fried rice, but you can also make this dish in your air fryer! 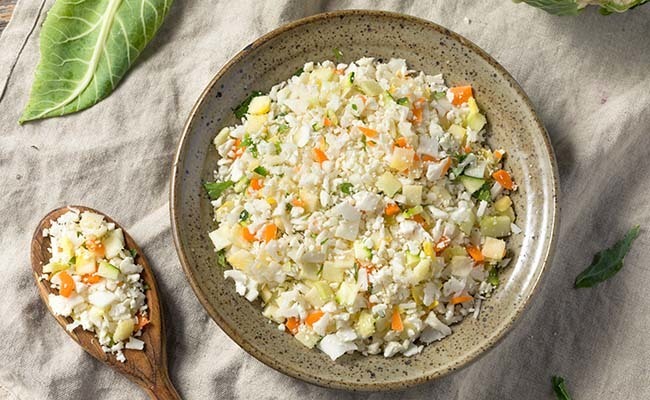 It’s super easy, and my recipe walks you through how to make this easy cauliflower fried rice with whatever veggies and plant-based proteins you want. Cauliflower rice can add a meaty texture to plant-based ground “beef”. This recipe pairs it up with hearty walnut and earthy mushrooms for a flavorful, toothsome taco filling. Roasted cauliflower rice adds texture and sneaky veggies to this deeply-seasoned coconut curry. Serve with even more cauliflower rice on the side, if you want to really up the veggie ante. Who knew that you could use cauliflower rice to make a creamy risotto? Kristina at Spabettie, that’s who! She piles the cauliflower risotto onto sautéd polenta rounds and tops them off with crispy shiitake mushrooms for a perfect special-occasion meal. Barley, beans, and cauliflower rice come together in a filling grain salad that could easily be a meal all on its own. Tossed with a simple vinaigrette, this is a great make-ahead meal for picnics or packed lunches. Biryani is a seasoned Indian rice dish, and cauliflower rice steals the show in this recipe. Serve it up with a dollop of dairy free tomato raita, and supper is SERVED! Cauliflower rice photos via Getty Images. All recipe images via recipe authors, used with permission.